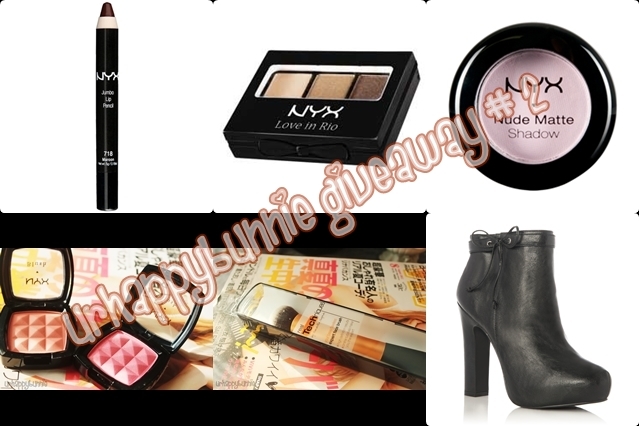 UrHappyBunnie: Urhappybunnie's Thank You Giveaway #2! As I said on the first Giveaway post, I will be having two giveaways running at the same time! Yay! If you haven't read the other post, my reason for having two giveaways is to find a new home for the brand new Just Fab booties I ordered two months ago. I was really sad coz I am in love with them but unfortunately they don't fit me coz I have wide feet and the shoes are too narrow for me. The size is in US 6.5. Thank you guys for your support on my blog and I hope that you will continue on doing so. Even if I don't put up regular posts I hope that you will look forward and enjoy my blog. So here is my second giveaway! Love the giveaway, you're too kind! Favorite High End would be Guerlain Meteorites pressed powder. Favorite Drugstore would be NYX Cream Blushes. LOVE! My favorite high end product is anything by Urban Decay or Bare Essentials and my favorite low end is good old (yet reliable) NYC nail polish! I love all the ELF stuff, can't beat the price!